I am so excited that I have been published for the first time in Interweave Knits Fall '08! Dumpling makers are taking over the world as evidenced by this - update as of Oct'09 there are over 900 Dumplings on Ravelry and it is in second place as far as the most popular bags of all time. I had no expectations, so to say this has exceeded my expectations wouldn't be the truth. What would be the truth is that I am thrilled and delighted to see everyone's creativity! 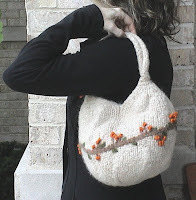 I have just finished Stitches Midwest '08 and am happy to say that the Dumpling won many many new fans !!! Believe it or not (and believe me I was thrilled to death and speechless when this was happening) people were waiting in line to "Make there own" Dumpling Buffet I had set up! To find out about the Dumpling Kits that are available either as standard which is a wristlet size bag or Double Dumpling which is a shoulder bag go to my She-Knits.com page which will give you a link to my shop HERE . The standard Dumpling Kit (black Dumpling pictured to the left) comes in Onyx (black) for the bag body, with a celery vine, garnet berries, deep plum lucite rings rings and a magnetic snap plus grosgrain ribbon for mounting the snap. The cost is $19.00 without the pattern (if you already own it) and $25.00 with the pattern+ shipping. 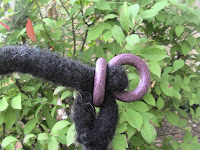 IMPORTANT PATTERN MODIFICATION - The standard Dumpling pattern is written holding two strands of a worsted weight yarn, for the kit you receive bulky weight yarn so therefore you need only use a single strand for the standard Dumpling however you use a double strand for the Double Dumpling. The rings that come standard with the regular Dumpling Kit is a deep plum Lucite ring that has the look and feel of wood or porcelain. If you are looking for rings ONLY there is more information regarding purchasing rings below. 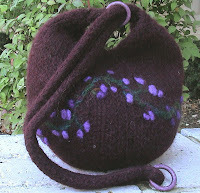 Below is a picture of them, the regular wristlet Dumpling uses the smaller sized ring and the Double Dumpling shoulder bag kit I use the larger sized ring which is available in a warm brown, or deep purple. Prices for rings only is below, underneath the information about the Double Dumpling Kits. The Double Dumpling Kit(above) comes in either oatmeal with an oak vine and orange berries, or in aubergine with green/brown vine and bright purple berries. The Oatmeal kit comes with large brown rings and the Aubergine kit comes with large deep plum rings. Both kits come with a snap set-up. If you would like the Double Dumpling in a different color see the above link under COLOR OPTIONS. The Double Dumpling kit is $30.00 plus shipping without the pattern and $37.00 with the pattern + shipping. 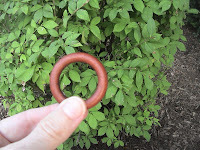 Large sized rings (set of two) for the Double Dumpling (below) - are approx 6 cm. 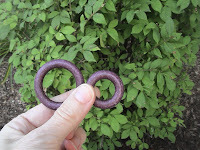 ( pictured below)- the larger rings come in either dark purple or warm browns and are both $3.70 (for a set of 2) + shipping. Contact me through She-Knits.com and let me know which rings you would like and your mailing address and I will then get back to you with the total. After you ok the total I will bill you through a Paypal money request or give you my number for you to call in a charge card to me. I still am in recovery mode and truly (and gratefully) busy with kitting up many orders (I ran out of some kits and am ordering yarns and shipping) but while the emotion is there I have to state that this was one of the most incredible experiences of my knitting life. Not only was it validating as a designer (you know me in my cave with my kids and husband...there is only so much feedback one can expect here!) ...as Sally Field said at the Oscars, they liked me, they really really liked me! But meeting my She-Knits cyber knitting circle members blew me away....it was incredibly surreal to meet real breathing people instead of just seeing their lovely keyboard strokes, or in some cases hearing their Skype voices. Also I just somehow felt so taken care of..everyone was so positive and helpful and CARING...I don't think i have ever had such a nice handful of people that were somehow watching my back too. So glad you had a good Stitches Midwest experience. Your bags are so cute. I enjoy your podcast. What's the size of the larger one? The Interweave pattern only had directions for the small one. BTW, the rings are tough to find. My LBS only had skinny silver/gold rings (sterling skinny ones were very pricey), and the lucite thickness is much better, I think! Beautiful bag! 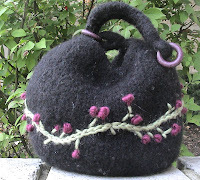 I was visiting Judy S's blog & loved the one she made. Very talented. Judy mentioned you were in Chicago -- hope you are not flooded out there. We had a terrific amount of rain here in Indiana.